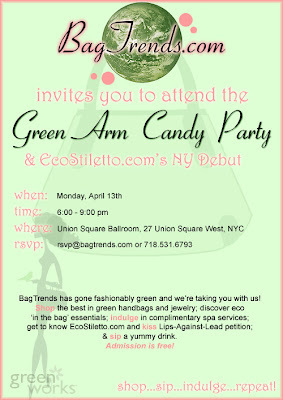 Lovely Pamela of http://bagtrends.blogspot.com/ is throwing this GREEN shopping party! See what's new in Green Fashion, get a spa treatment, an eco-drink and of course a lovely giftbag! Aaargh, why every fun event is on Monday? You have no idea how many fabulous events I've missed because they're all on Mondays and Monday is the only day when I'm not in the city. Oh, well, tough luck. Enjoy it!